The International Committee of the Red Cross (ICRC) recently gave training on the law of armed conflict (LOAC) to senior military leaders of the Karen National Liberation Army (KNLA). 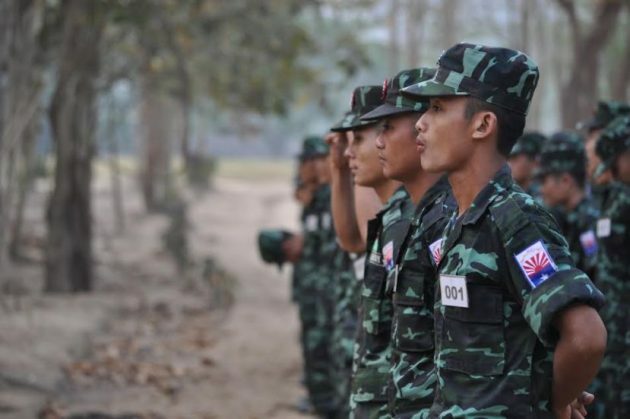 Over 40 military leaders from the KNLA under the KNU Brigade 7 attended the training, which was held in an area under the control of the Karen National Union (KNU) Brigade 7 on 28 and 29 November, according to Lieutenant Saw Swee Nay Soe from the KNLA, who led the training. He also said that though the KNLA already have their own laws of armed conflict they held the training so that they could learn about the international laws of armed conflict and compare them with the KNLA laws of conflict. Officials from the Rangoon-based ICRC explained international laws covering armed conflict and those covering humanitarian issues. They also discussed the ICRC’s work and exchanged views with the KNLA about the KNLA laws of conflict. The ICRC previously gave training to the KNLA on the laws of conflict in 2013 and the United Nations Children’s Fund (UNICEF) gave awareness training in cooperation with the KNU in September of this year on how to prevent the use of child soldiers. The ICRC was established in 1863 to assist all refugees during conflicts and to urge governments and armed groups to follow international humanitarian law.